Change things up with these side-trips from Cairns: Palm Cove (Spas & Wellness & Palm Cove Beach). Spend the 21st (Thu) among aquatic life with a scuba or snorkeling tour. Spend the 22nd (Fri) wandering through the wild on a nature and wildlife tour. There's still lots to do: hike along Esplanade Boardwalk, take a memorable tour with Tours, take in the waterfront at The Jack Barnes Bicentennial Mangrove Boardwalk, and admire the natural beauty at Botanical Gardens. Auckland, New Zealand to Cairns is an approximately 8.5-hour flight. The time zone difference moving from New Zealand Standard Time to Australian Eastern Standard Time (Queensland) is minus 2 hours. When traveling from Auckland in February, plan for a bit warmer days and about the same nights in Cairns: temperatures range from 36°C by day to 28°C at night. Finish your sightseeing early on the 25th (Mon) so you can take a bus to Cape Tribulation. Take a break from Cape Tribulation with a short trip to Cow Bay Beach in Cow Bay, about 42 minutes away. Spend the 28th (Thu) exploring nature at Daintree National Park. The adventure continues: look for all kinds of wild species at Daintree Rainforest - Cooper Creek Wilderness, enjoy the sand and surf at Myall Beach, admire the natural beauty at Marrdja Botanical Walk, and explore and take pictures at Cape Trib Farm. To see more things to do, photos, and other tourist information, read our Cape Tribulation journey maker site . You can take a bus from Cairns to Cape Tribulation in 3.5 hours. Another option is to drive. In February in Cape Tribulation, expect temperatures between 36°C during the day and 28°C at night. Wrap up your sightseeing on the 1st (Fri) early enough to travel to Port Douglas. Spend the 2nd (Sat) among aquatic life with a scuba or snorkeling tour. Spend the 3rd (Sun) spotting exotic species with a safari tour. There's much more to do: look for all kinds of wild species at Hartley's Crocodile Adventures, tour the pleasant surroundings at Four Mile Beach, get to know the resident critters at Wildlife Habitat Port Douglas, and stop by With Sugar. To find where to stay, other places to visit, maps, and tourist information, read Port Douglas trip planning tool . Traveling by combination of car and ferry from Cape Tribulation to Port Douglas takes 2 hours. Alternatively, you can take a bus. In March, daily temperatures in Port Douglas can reach 36°C, while at night they dip to 27°C. Cap off your sightseeing on the 5th (Tue) early enough to travel to Airlie Beach. On the 6th (Wed), spend a thrilling day on the water with a speed boat tour. Spend the 7th (Thu) among aquatic life with a scuba or snorkeling tour. There's much more to do: get interesting insight from Tours, paddle through the water with a kayaking and canoeing tour, explore the galleries of Above & Below Photography, and contemplate the waterfront views at Heart Reef. To see other places to visit, more things to do, reviews, and more tourist information, go to the Airlie Beach itinerary builder site . Traveling by combination of shuttle, flight, and ferry from Port Douglas to Airlie Beach takes 6 hours. Alternatively, you can do a combination of shuttle, flight, and bus; or drive. In March, daytime highs in Airlie Beach are 33°C, while nighttime lows are 28°C. Cap off your sightseeing on the 9th (Sat) early enough to catch the ferry to Hamilton Island. Spend the 10th (Sun) among aquatic life with a scuba or snorkeling tour. There's much more to do: step off the mainland to explore Whitsunday Islands National Park, soothe aching muscles at some of the top local wellness centers, tee off at Hamilton Island Golf Club, and view the masterpieces at Hamilton Island Art Gallery. To see more things to do, reviews, where to stay, and tourist information, refer to the Hamilton Island trip maker tool . You can ride a ferry from Airlie Beach to Hamilton Island in an hour. In March, daily temperatures in Hamilton Island can reach 33°C, while at night they dip to 28°C. 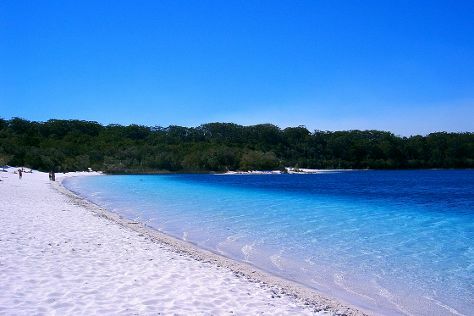 Cap off your sightseeing on the 13th (Wed) early enough to travel to Fraser Island. Fraser Island is known for nature, wildlife, beaches, outdoors, and historic sites. Your plan includes some of its best attractions: explore the activities along Lake McKenzie, kick back and relax at Eli Creek, head off the coast to Waddy Point, and don't miss a visit to K'gari. Traveling by combination of flight, ferry, and car from Hamilton Island to Fraser Island takes 9 hours. Alternatively, you can do a combination of ferry, bus, and car. Traveling from Hamilton Island in March, you can expect nighttime temperatures to be little chillier in Fraser Island, with lows of 24°C. Finish up your sightseeing early on the 18th (Mon) so you can travel to Noosa. You'll find plenty of places to visit near Noosa: Mount Coolum (in Coolum Beach), Caloundra (Bulcock Beach & Kings Beach) and Mount Ninderry (in Yandina). 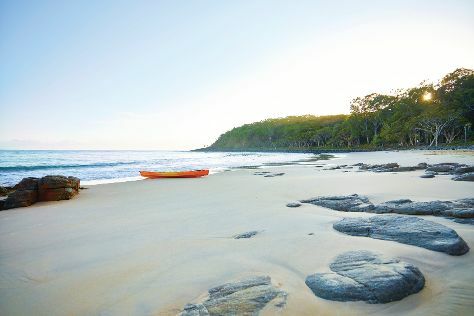 Spend the 19th (Tue) exploring nature at Noosa National Park. There's much more to do: tour the pleasant surroundings at Noosa Main Beach, explore the activities along Noosa River, head outdoors with Phippsy's Smooth Water Charters, and enjoy the sand and surf at Peregian Beach. To see photos, traveler tips, where to stay, and more tourist information, read our Noosa visit planning site . Do a combination of car and ferry from Fraser Island to Noosa in 7 hours. Alternatively, you can do a combination of car, ferry, and train; or do a combination of car, ferry, and bus. Cap off your sightseeing on the 23rd (Sat) early enough to go by car to Maleny. Change things up with these side-trips from Maleny: Mooloolaba (Mooloolaba Beach, Scuba & Snorkeling, & more) and Nambour (Dulong Lookout ( Kanyana Park ) & Podie Pie). 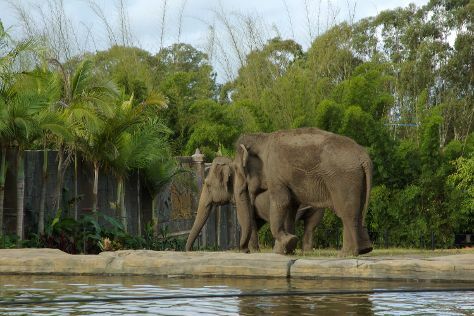 There's much more to do: get to know the resident critters at Australia Zoo, admire the sheer force of Kondalilla Falls, trek along Mary Cairncross Scenic Reserve, and admire the natural beauty at Maleny Botanic Gardens & Bird World. For other places to visit, more things to do, and other tourist information, you can read our Maleny trip maker tool . Traveling by car from Noosa to Maleny takes 1.5 hours. Alternatively, you can take a bus; or take a train. In March, daily temperatures in Maleny can reach 32°C, while at night they dip to 23°C. Wrap up your sightseeing on the 26th (Tue) early enough to drive to Brisbane. You'll find plenty of places to visit near Brisbane: Sea World Theme Park (in Main Beach) and Warner Bros. Movie World (in Oxenford). There's still lots to do: walk around South Bank Parklands, stop by Noosa Chocolate Factory, take in nature's colorful creations at Brisbane Botanic Gardens Mt. Coot-tha, and laugh and play at Wheel of Brisbane. For other places to visit, maps, reviews, and more tourist information, read our Brisbane online visit planner . Traveling by car from Maleny to Brisbane takes 1.5 hours. Alternatively, you can take a train; or take a bus. In March, daily temperatures in Brisbane can reach 32°C, while at night they dip to 23°C. Wrap up your sightseeing by early afternoon on the 31st (Sun) to allow time for travel back home.